Q1: Describe the different work that children did in the collieries. A1: Children were mainly employed to transport coal (sources 1, 2, 5, 7, 8, 9, 10, 11, 14, 16, 17 and 19). Children also worked as trappers (sources 1, 13 and 14). Q2: Why did most children dislike working in the collieries? A2: Trappers often complained they did not like working on their own in the dark (see sources 3, 5 and 7). Children also disliked the long hours. Rosa Lucas (source 6) points out: "I go down (the mine) between three and four in the morning and sometimes I have done by five o'clock in the afternoon." These long shifts left them feeling exhausted. Anne Eggley (source 7) said: "I am very tired at night. Sometimes when we get home at night we have not power to wash us, and then we go to bed. Sometimes we fall asleep in the chair." Working in the mines was also very dangerous. Alexander Macdonald (source 9) claimed when he was 47 years old, that when he first started work "there were some 20 or more boys besides myself, and I am not aware at this moment that there is one alive excepting myself". Rosa Lucas was a victim of one of these accidents: "I was sitting on the edge of a tub at the bottom, and a great stone fell from the roof on my foot and ankle, and crushed it to pieces, and it was obliged to be taken off. Children interviewed by the Children's Employment Commission Report (source 14) often complained about being beaten by adult miners. Another cause of complaint concerned working conditions. This included working in low and narrow underground passages (sources 2, 16 and 20) and carrying heavy sacks of coal (2 and 7). Another factor was the heat underground. Isabella Read (source 17) stated that "when the weather is warm there is difficulty in breathing". Q3: Why did the colliery owners like employing children? A3: Robert Hugh Franks (source 16) an inspector of mines in Scotland, reported that children were used to mine and carry coal in narrow and low underground passages "crawling on hands and knees". Charles Vane, 3rd Marquess of Londonderry (source 23), argued in the House of Lords that there were strong economic reasons for employing young children in mines: "In the thin coal mines it is more especially requisite that boys, varying in age from eight to fourteen, should be employed; as the underground roads could not be made of sufficient height for taller persons without incurring an outlay so great as to render the working of such mines unprofitable." In the words of Janet Selkirk (source 20) the "roads are so low and narrow that small persons only can pass". Q4: Why did Thomas Tooke believe that it coal mining was a healthy occupation for children? A4: Thomas Tooke (source 12) claimed that coalmining was a healthy form of employment. He argued that carrying coal "greatly develops the muscles of the arms, shoulders, chest, back and legs". Q5: Select evidence from this unit to show that the 1842 Mines Act did not bring an end to child labour in the collieries. A5: In source 27, Eric Hopkins, the author of A Social History of the English Working Classes (1979) points out the 1842 Mines Act stated that no children under the age of 10 could be employed underground. 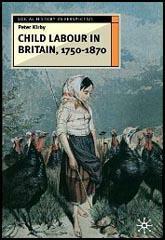 However, Peter Kirby, (source 28) the author of Child Labour in Britain, 1750-1870 (2003), argues that "underground inspection" was very difficult because of "widespread - and often violent - opposition among employers and miners". Even, the man behind the legislation, Anthony Ashley-Cooper (Lord Shaftesbury), admitted that underground inspection was "altogether impossible, and, indeed, if it were possible it would not be safe... I, for one, should be very loath to go down the shaft for the purpose of doing some act that was likely to be distasteful to the colliers below". Kirby points out that the "Mines Act tended to be applied only where it was in the interests of colliery owners". It was not until 1872 that the age was raised from 10 to 12 and eventually to 13 in 1903. However, this legislation was not rigorously enforced and source 25, shows 12 year-old John Davies at work at a colliery in South Wales in 1909. Q6: Why is it important for a historian to look at a wide-range of different sources when writing a book on what it was like to be a child working in a colliery? A6: The owners of coalmines and the people who they employed often disagreed about what the conditions were like underground. Thomas Tooke (source 12) claimed that coalmining was a healthy form of employment. Campaigners against children working in coalmines disagreed that it was a healthy occupation. They argued that working long-hours in set-positions, when young, caused bodies to become crippled. It was also feared that the coal dust and damp conditions in mines were responsible for other long-term health problems. The historian also has to take into account the opinions of adult miners. According the manager of the South Heaton Colliery (source 21): "Of the children in the pits we have none under the age of eight, and only three so young. We are constantly beset by parents coming making application to take children under that age, and they are very anxious, and very dissatisfied if we do not take the children... there have been cases in times of brisk trade, when the parents have threatened to leave the colliery, and go elsewhere if we did not comply". The owners of coalmines were aware that if they lost the freedom to employ young children in the mines they would have to pay adults to do this work. This would inevitably increase their costs and reduce their profits (source 23). The owners of coalmines had good economic reasons for denying that this work had a bad effect on the health of their child workers. Therefore, a historian would get a very distorted picture of what life was like for a child working in a mine if he or she only studied sources provided by the owners of coal-mines. Therefore a historian writing a book on this subject would want to study sources that reflected a wide-range of different opinions about children working in coalmines.